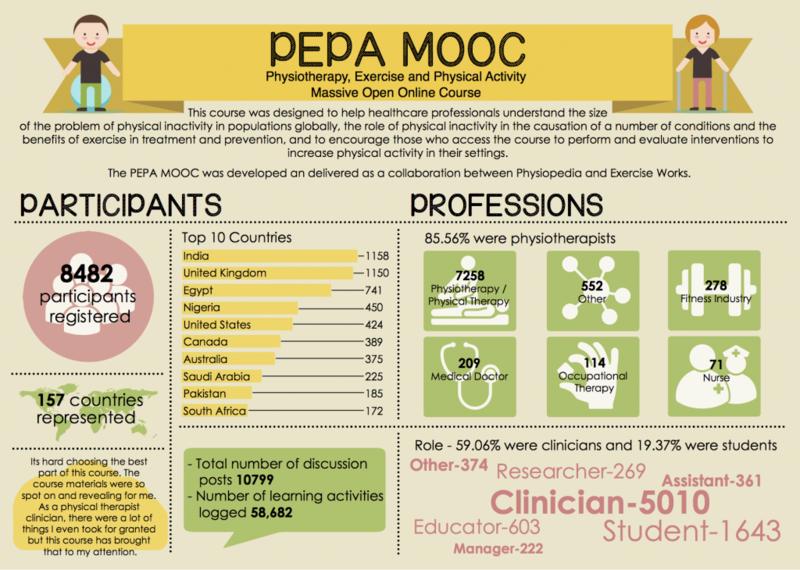 Over 6 weeks in June 2016, in collaboration with ExerciseWorks, Physiopedia delivered it’s fourth Massive Open Online Course (MOOC) on the topic of physical activity. 8,482 participants formally registered for the Physiotherapy Exercise and Physical Activity course, representing 157 countries and 86% were physiotherapists. The course was delivered using our innovative online learning platform Physiopedia Plus that has been specifically developed to deliver online education and professional development to Physiotherapists and Physical Therapists worldwide. The platform provides a personalised learning environment for the student that records all learning activities and achievements in an innovative activity log and learning dashboard. The learning activities including the books, quizzes, discussions and certificates are provided securely once a user has logged into the system. Every user also has the opportunity to record a reflective note on each learning activity, particularly important for countries where evidence of professional development is output based such as the UK. To complete the course, participants had to complete 65 learning activities including 14 videos, 6 quizzes and 12 contributions to the discussion forum. Over the 6 weeks of the course nearly 59,000 learning activities were logged by the system representing around 32,000 hours of learning activity! One course activity asked participants to devise a short elevator pitch to promote a project to increase physical activity in their context. A handful of participants took up the optional challenge to record and share their pitches on YouTube. These videos continue to offer an amazing insight into the wide range of course participants and their wealth of ideas which can still be viewed here. To pass the course and receive a certificate of completion the participants were finally required to pass the a quiz with an 80% pass rate. At the date of this post over 504 people had completed the entire course and downloaded their certificate. Thank you for providing this most valuable education about not only physical activity and why it is beneficial, but also about how to interact with patients and society to implement change. While physical therapists know so much about exercise and health, we do not always know how to engage with our patients to facilitate adherence. 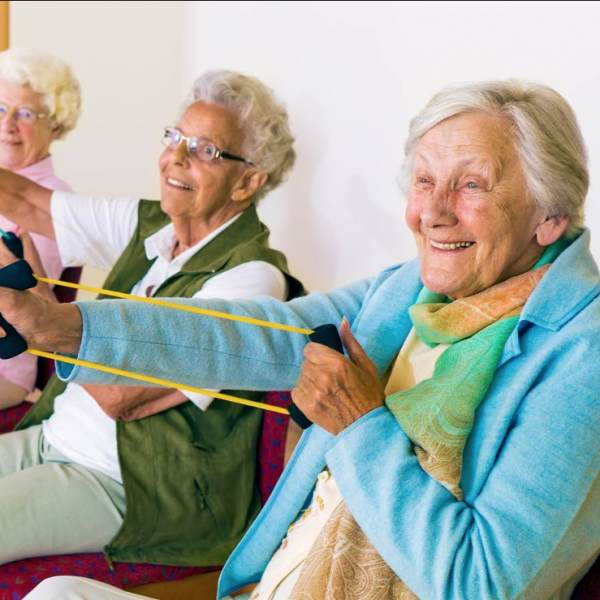 We can create a fantastic exercise program, but it is useless if the patient won’t do it. This course will forever change how I practice on a daily basis and how I educate future physical therapists about the impact they will have on the health of their patients and the populations in which they live. I have no doubt that this course will have a ripple affect across the world. Thank you for all you did to create this course! Going through the many different topics of this course has reinforced with me the absolute necessity to make each contact count with patients. It’s easy to approach giving your advice/knowledge/opinion etc. in the same way to every patient and it’s good to be reminded that every patient is different and that the ideal outcome is not always realistic, or desirable for the patient involved. making progress towards that ideal is realistic and invariably, in some way, desirable for the patient. Thank you. The Physiopedia team were extremely pleased once again with the outstanding response to this free and open and course. We hope to develop and deliver more such courses in the coming years. 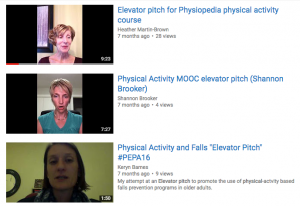 We encourage physiotherapists and physical therapists around the world to continue to support these courses with their enthusiastic participation and to sign up the Physiopedia newsletter to stay updated!